The history of Milan is closely connected with the creation of the Navigli, which pass as water network the whole city. Milan hasn’t a direct river connection. 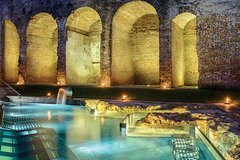 To ensure the water supply and to create transport routes, just in the antique ages was begun with the construction of artificial waterways, fed by the rivers of the hinterland (Ticino, Lambro, Adda). Thanks of the connection of artificial waterways from the rivers Ticino and Adda towards the Po River, Milan is practically connected to the Adriatic Sea. On the banks of the Naviglio formerly lived workers and artisans. 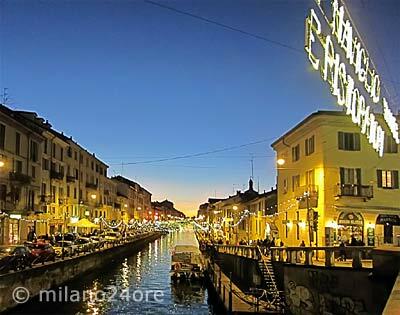 Today, the area of the Naviglio is a romantic area to stroll. Artists' studios, original shops, romantic pubs, flea markets, and summer concerts make the area the Naviglio is a unique venue. Outside Milan the water network serves for the irrigation of the fertile Padana fields Po Valley (the Europe’s largest plane extended from Milan to the hills). On the configuration of the locks of the channels already worked Leonardo da Vinci. The oldest canal was built in the years 1177-1257 and is fed by the river Ticino. The Naviglio Grande is about 50 km long and served as export and import route. For the transport of the enourmes marble blocks from the reservoirs at Candoglia on Lake Maggiore, which were needed for the construction of the Milan Cathedral, the Naviglio was extended up to the cathedral. At the time of the construction of the cathedral, the waterway was conducted into the city center. The street name Via Laghetto (road by the pond) behind the cathedral testifies that. Today this part of the Naviglio is filled. Along the Naviglio Grande towards Ticino you will find the villages Cesano Boscone, Assago, Buccinasco, Corsico, Trezzano sul Naviglio, Gaggiano, Vermezzo und Abbiategrasso, that use the waters of the Naviglio for agriculture. Typical are the old houses and wash houses with wooden roofs and craftsman housesthat that remember past times. Today they house artists' studios, cafes, restaurants behind the typical facades and provide an ideal atmosphere for the evening meeting the Milan's youth. Naviglio Grande and Naviglio Pavese meet in the old harbor, the Darsena. Built in the 14th century, here is the connection between Naviglio Grande and the 35 km long Naviglio Pavese, which continues to flows about Binasco and Pavia to the river Po and the Adriatic Sea. An old sluice called "Conchetta" was set in motion again at the Naviglio Pavese. The special feature of the sluice is the hydraulic mechanism that Leonardo da Vinci invented to facilitate the opening of the locks. Thanks to a simulation, the invention of Leonardo was made ​​visible again. 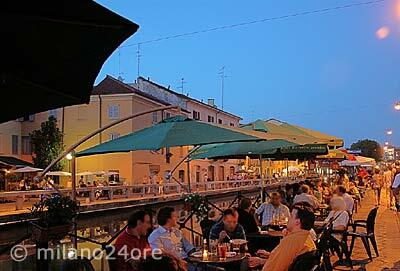 The port Darsena was built in 1603 as a trade hub and is the main link between the Navigli. The Naviglio Grande is flowing into the Darsena while Naviglio Pavese and Ticinello are flowing out. Along the Darsena there is a weekly market held on Saturdays, where mainly second-hand goods and antiques are offered. 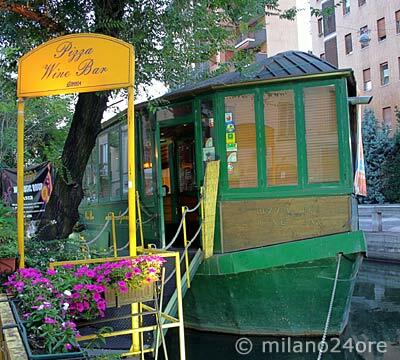 The boat trip on the Canal Naviglio takes about one hour. 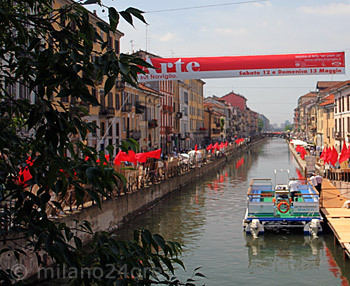 It starts on the Naviglio Grande, pass the houses of the historic Milan and arrives the old bridges in the former harbor Darsena to continue the Naviglio Pavese to the lock where, thanks to the simulation, the inventions of Leonardo da Vinci are to be admired. The Naviglio della Martesana gets its water from the river Adda, which is powered from the side arm of Lake Como, the Lago di Lecco. The Naviglio della Martesana flow through the towns of Gorgonzola and Cernusco sul Naviglio and disappears in the center of Milan Garibaldi. Along the Naviglio della Martesana leads a popular cycle route from Milan to the river Adda. There the cycle way continues to north along the river Adda to Lecco. Enjoy an amazing 3-hour food walking tour through the historic Brera district of Milan. Sample local food and delicacies as you stroll through the charming neighborhood.